Spartan Villas are located in Elounda, eastern Crete, Greece. 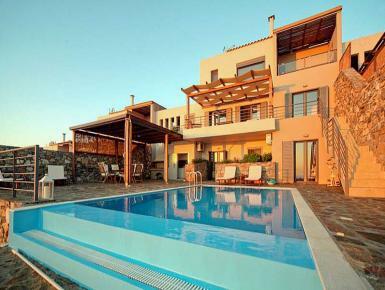 Arranged on a hill these three storey villas offer breathtaking views over the Mirabello Bay and the Aegean Sea. Each villa is ideal for up to 6 people with its own 24sq meter infinity pool offering panoramic views of the landscape. In addition each Spartan villa has a spacious 140sq meter sun terrace with pergola, large outdoor dining area and an ample stone built BBQ for unforgettable memories. At the front of each villa lies its own private garden. On the first floor there is a comfortable living room with open fireplace and a fully equipped kitchen with large fridge freezer. Both rooms share a large balcony that offers an unobstructed view of the Cretan landscape.